We have a pretty big immediate family and buying gifts for everyone can really get pricey, especially when the family shows no sign of slowing down in size! To help everyone save some extra dough during the most-expensive time of the year, we now do our annual Secret Santa extravaganza. That way we get one really good gift, for just one person, instead of buying gifts for the entire family. Here is how it works – first we draw names. If your family lives close to one another, you can easily draw names out of a hat when you are all together. If everyone is spread out in different states like we are, we like to use Elfster.com. The site electronically draws your secret Santa, emails you the name and allows each participant to create a ‘wish list’ for their secret Santa to see. This way, everyone gets gifted something they actually want, something they wished for! On the day of the exchange, each person in our family comes up with 3 short clues about their secret Santa, prior to announcing who they are, to get everyone involved in the fun. Create a budget that works for your family and remember, the hardest part is keeping your secret! *** If you like the gift wrapping idea in the photo above, read ahead. 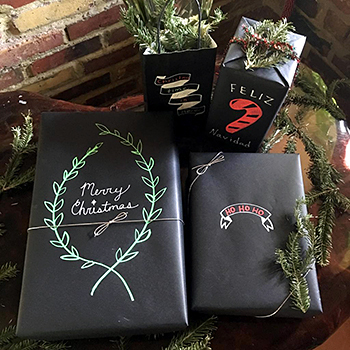 Use standard black (or any color) kraft paper and metallic markers to draw on it - super easy to do and these markers don't smear. This one is for the ladies in our fam, but anyone who contributes is welcome! This is how it works – everyone who participates in the cookie exchange must bring 4 dozen already-made cookies. They can all be the same type of cookie or each dozen can be a different type, just as long as you bring the bare minimum. Once everyone is together, in between the dancing and laughter, we place all the cookies onto one big table. Later, each person goes around the table and chooses 4-dozen cookies from each batch everyone else made and some of yours too – whichever 4-dozen cookies you want! We find the best way to take your cookies back home in pristine condition, is to place them in a tin. Holiday cookie tins are easily available and are great for re-gifting. Which brings us to the final step – the re-gifting! You now have 4-dozen delicious cookies to share as gifts for every occasion to whomever you wish. We find they are great to give to those co-workers you appreciate or maybe your mailman, but trust that whoever gets your delicious cookies will appreciate the effort of homemade treat. A simple cellophane clear bag with a celebratory ribbon is also a great way to gift a smaller amount of cookies. We look forward to getting together for our Annual Holiday Cookie Exchange each year, but this fun tradition can be celebrated for any type of occasion, any time of the year! We hope you enjoy it as much as we do. Our entire family gathers on Christmas Eve and we now have a lot of little ones running around. Being a big family, we can totally understand the chaos that comes with dinner, gifts and all of the other drama the holidays bring. Over time, we have found that our little ones look forward to this tradition each year and it keeps them entertained for a little while at least. It’s fun to watch the tradition grow every few years, with the new additions adding to the annual tradition. We just buy a small fake Christmas tree, feel free to buy a bigger one if you see fit, buy some non-breakable ornaments and let them do their thing. You will be surprised to see the teamwork as they decorate the tree, bringing out each ones independent creativity. You will also see them admiring their work throughout the night – overall, it’s always a crowd pleaser with the kiddos. Be ready for holiday gatherings! Order a Lo.Co Starter Set for your guests to put their devices aside in the Lo.Co Device Bag and use the Lo.Co Starter Cards to start great conversations. Perfect for parties, dinners, office events or rainy days at home. There’s a Spanish version too.